The other day, I mentioned that I was particularly thrilled about a tea shop I found in Nice. Decided that including La Route du Thé in a post with the others was not giving it the attention it deserved. 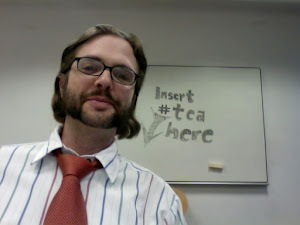 I'll actually go back and link to this post in the earlier one just to make sure no-one overlooks this place. That's how convinced I am. A tea shop is a tea shop, right? They're all offer pretty much the same thing. Why make such a fuss about this one or that one? Well, once you've seen enough different establishments, there are some that just stand out. Sure the quality of the tea and tea ware they offer is paramount, but there's something intangible that draws you to certain places. This place has that intangible thing for me. If I lived in Nice, this would definitely become one of my regular haunts. For one thing, the tea seller himself (Alain Bantwell) is clearly passionate about tea in general. But when he talked about his tea, his eyes lit up. You'd expect that always, wouldn't you? And let's face it: if you've dedicated yourself to having your own tea shop, you're most likely quite convinced about tea. Once again, this guy had that and more. He spoke enough English and I spoke enough French that we were able to get our basic thoughts across to one another, but when he started showing off his tea...well, did I mention the 'eyes lighting up' thing? Pretty sure I did. Then, he let his lovely assistant, who spoke English quite well (and insisted that I not include her name) tell me about the shop. She spoke highly of a Salon du Thé in the beautiful Cimiez neighbourhood of Nice called L'Altro Cose Cosi. I really must check that out next time I'm in town. But back to the tea shop. That's what you're here for, right? 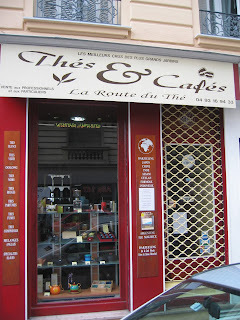 I'd not heard of the brand of tea La Route du Thé, but it's a relatively small company with five shops in Paris. You know I'm going to visit at least one of those when I'm next in the French capital. 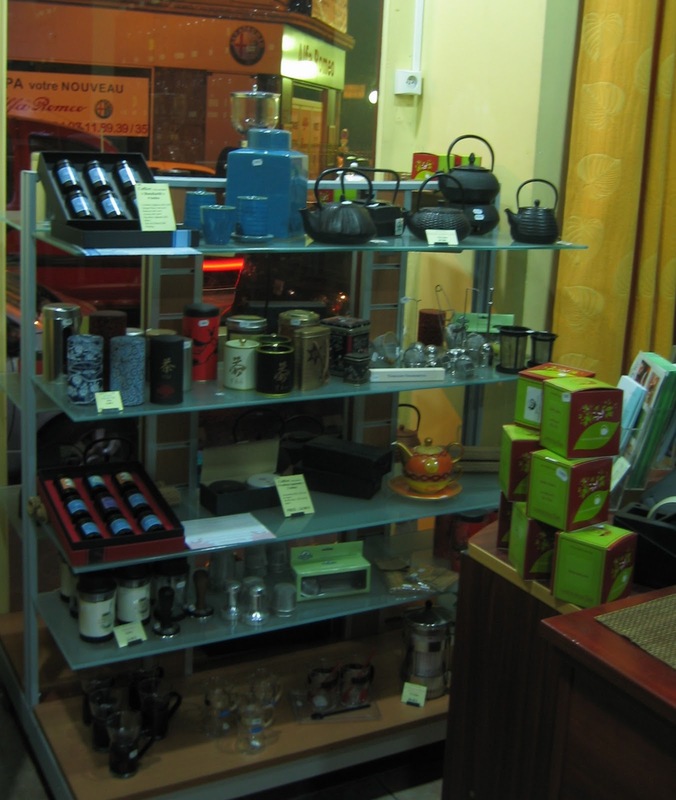 This is the only shop carrying their tea outside of Paris. Although he'd left me in very capable hands, Mr Bantwell came rushing out from the back of the shop because he clearly wanted to tell me something else that was important. It seems that all of the flavoured tea is made with all natural ingredients. He insisted that as a small company, they refused to use chemicals in any of their flavourings. Again, that this was important to him-that he made such a point of it, made me appreciate this shop all the more. He also knew I was based in Germany, where artificial flavourings are frowned upon. Most certainly. I asked him about his selection of Darjeelings, and he showed me a Darjeeling Puttabong whose leaves were so fragrant that I almost fainted. When I enquired what reliable tea was that he'd 'go to' nearly everyday, he opened a canister of golden-tipped Yunnan 'Celeste' that almost made me want to swear off any other Yunnan. Almost, but not quite. Oh, before I forget about those flavoured teas: he showed off some Réglisse Thé (licorice tea) that almost made me forget I'm not very keen on flavoured tea. The Amandes Thé (almond tea) also smelled divine, as did the several sorts of Earl Grey that he had. Not my sort of thing, but the leaves and Bergamot oil were very fragrant. 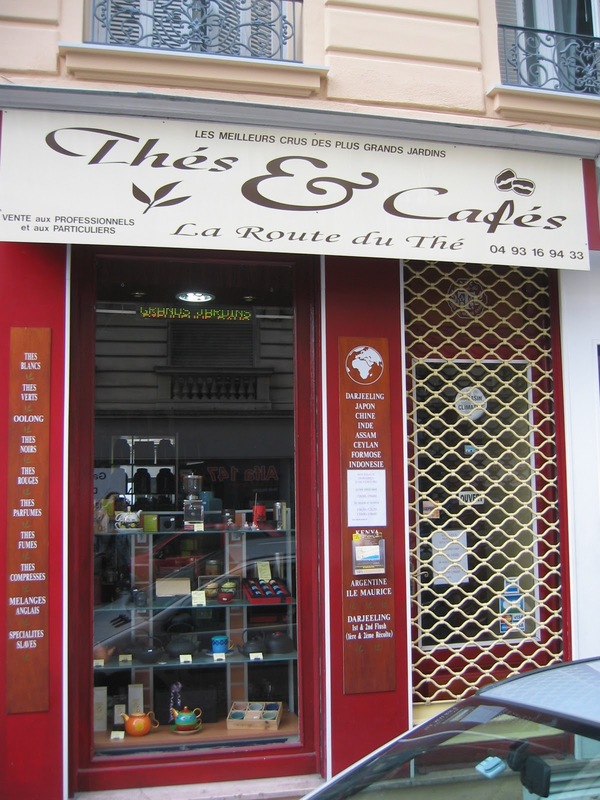 If you're in Nice, or anywhere nearby for that matter, I'd highly recommend taking a look at La Route du Thé (9 bis rue de Rivoli 06000 Nice Tel : 04 93 16 94 33). You'll be glad you did. Intangible or not, you describing one key thing in this post that will keep me coming back to a tea shop--having strongly aromatic pure teas. The #1 thing that makes me lose interest in tea shops here in America is that their tea does not smell fresh enough for me. If you want me to come back, you've got to deliver the goods, and at least as far as tea is concern, it's the natural fragrance of the tea that I intend to pay for more than anything else.